Small dogs need more than just a small kibble. They need more energy than big dogs, and they have a shorter and more intense growth period. Plus, they typically live longer than large dogs, and have a more finicky appetite. 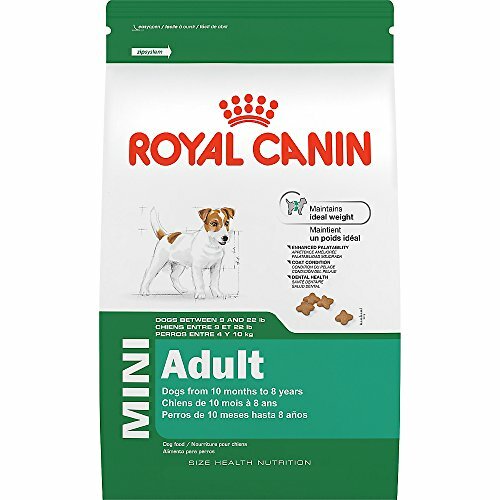 Royal Canin Mini formulas are designed to meet the specific needs of small dogs throughout every stage of their life. Small dogs have very distinct physiological traits such as jaw size, bone structure, digestive systems, and high energy requirements which can benefit from specialized nutrition. Helps maintain a healthy weight in small dogs by meeting their high energy needs while using L-carnitine to promote fat metabolism. Contains ideal levels of EPA and DHA to help support a beautiful coat and healthy skin.